Ever since seeing this recipe on Just One Cookbook, I've been itching to try this recipe! I've wanted to cook it with fresh pork slices but it's really tough getting them in Singapore. I was told that Meidi-ya sells it.. but I don't visit that supermarket that often.. Since I had Sunday free, I decided to cook this for the hubby and I. After all, it's something simple and quick after I spend several hours cleaning the kitchen and baking this Tri-coloured Kueh Lapis Legit. 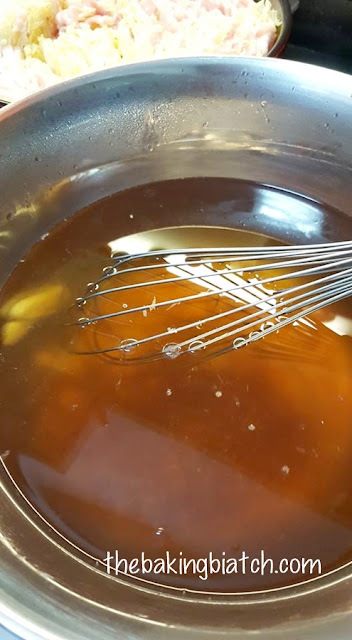 I made several modifications to this recipe.. but it still tastes really good. I've even done up a video on the layering! 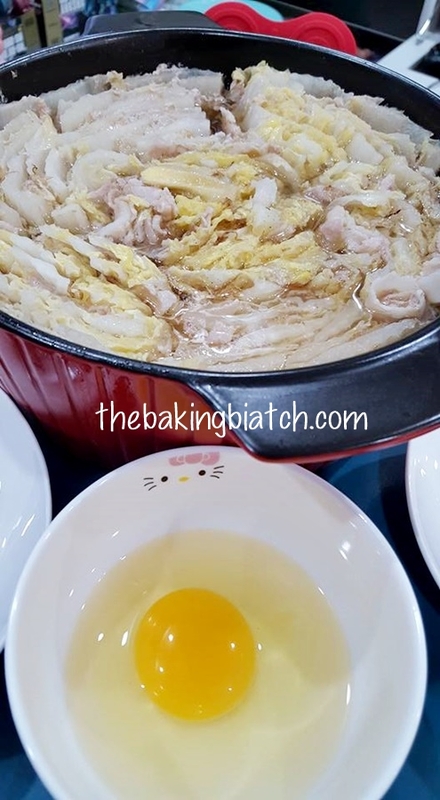 The recipe takes only 30 minutes to put together and cook.. and it goes really well with rice. I'd rate it a difficulty level 3 out of 5. Wash cabbage and cut into quarters (length wise). 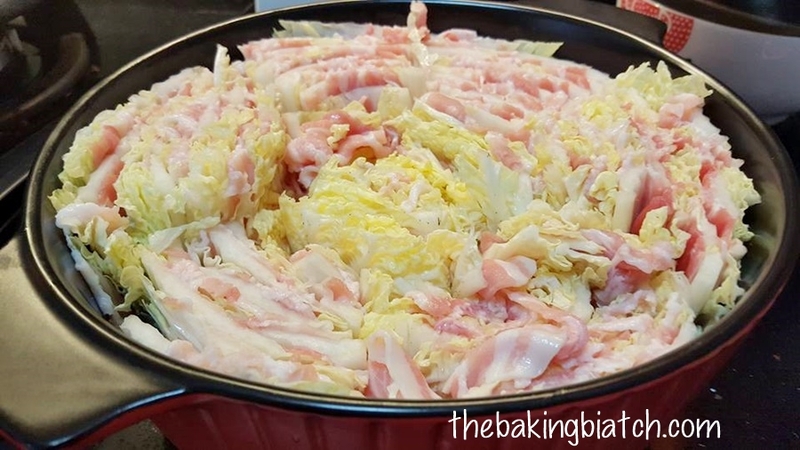 Layer pork slices between cabbage layers (Refer to video above). Cut into 3 sections. 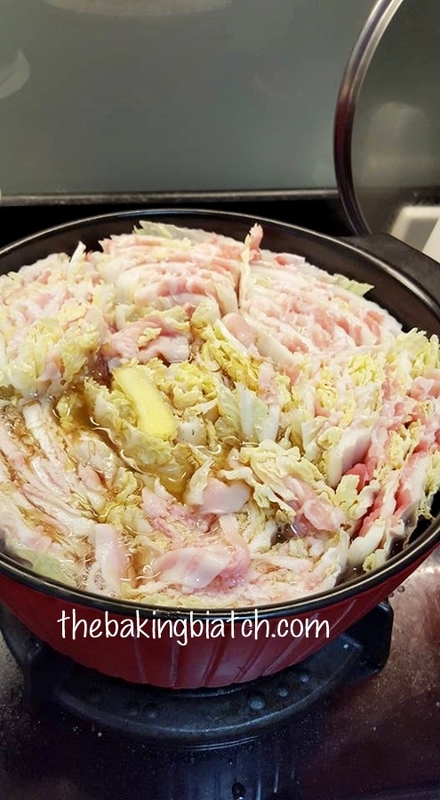 Line cabbage and pork layers into the pot. 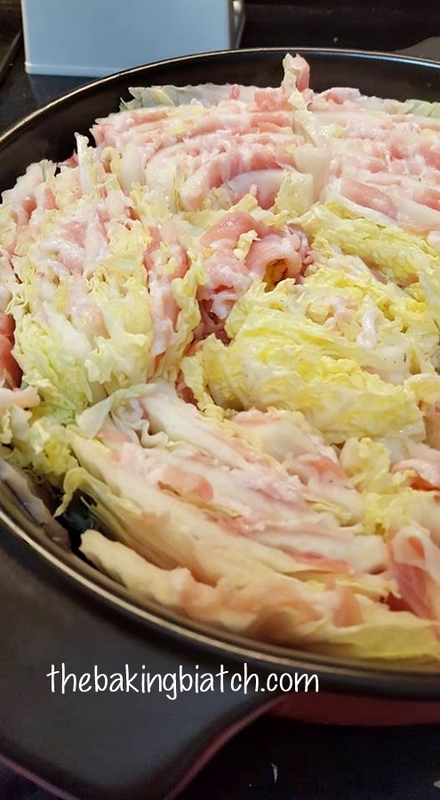 I kept the harder parts of the cabbage on the outer layers. Pack them as tightly as you can. If you do run out of cabbage, you can add enoki mushrooms (in the middle). 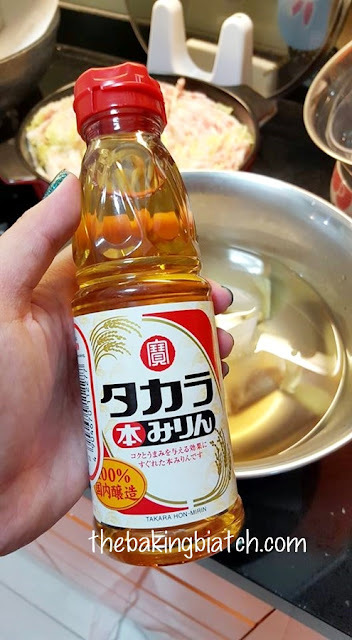 To make dashi stock, add 4 sachets of this Japanese Soup Stock into the hot water. Alternatively, cook your own dashi broth. These sachets can be gotten from supermarkets like NTUC/Cold Storage. 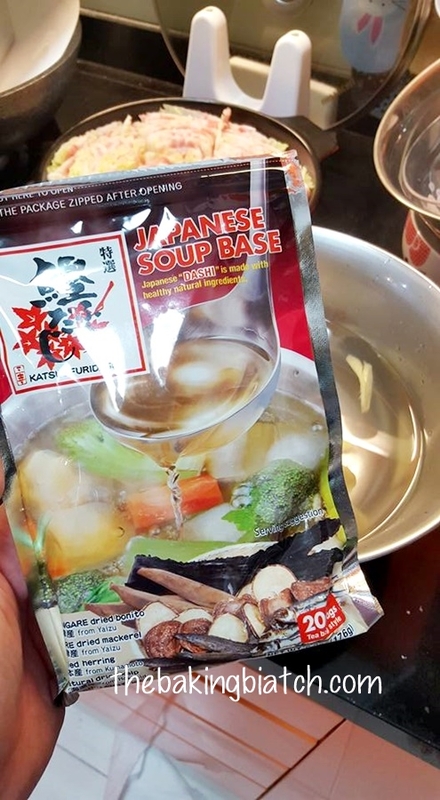 I love using them for my soup bases! Allow sachets to work for a minute or two.. squeeze out all the essence and remove sachets from the water. 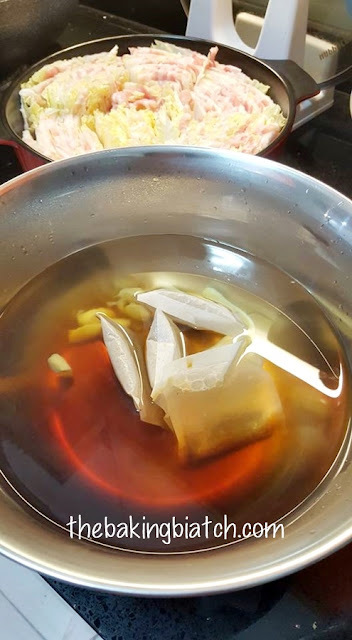 Add ginger slices to hot water. Add dashi only after you've sieved out the sachets. Add mirin, salt and soya sauce. Allow mixture to work the magic. 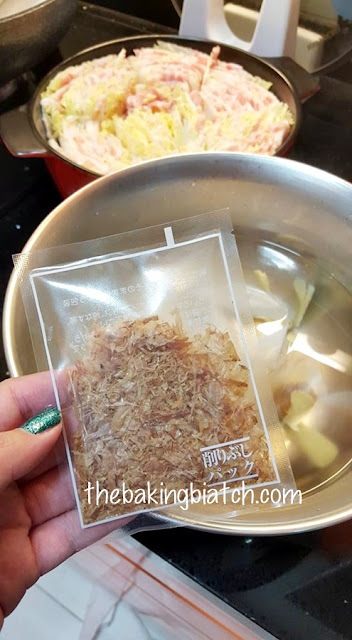 Remove sachets.. Add in dashi ONLY after you've removed the sachets. Bring stock to a boil. Remove scum and allow ingredients to boil on medium-low heat for 10 - 15 minutes or till the vegetables have softened and that the pork has cooked through. 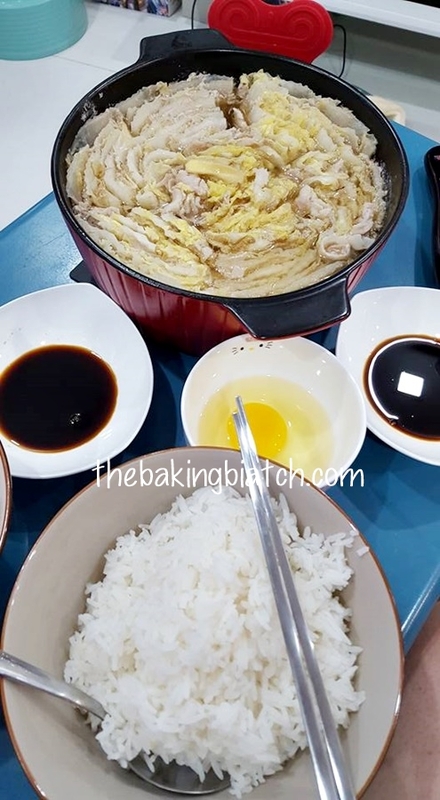 We had ours with hot rice and added an egg into the stock after we have had some of the vegetables. It was easy and delicious! Definitely a recipe that's here to stay!